When it comes to image editing, Photoshop is clearly the most popular software for the job, but it’s also the most expensive. Hobbyists and professionals alike use Photoshop, but many utilize only the most basic Photoshop features, and as a result they’re probably not getting their money’s worth. Buying Photoshop for simple tasks like cropping an image or adding a text overlay is a lot like swatting a fly with a sledgehammer. There have been several attempts to dethrone Photoshop as the best choice for basic image editing. For example, GIMP has secured a small following over the past few years as a free Photoshop alternative. It may lack some of the features and functionality of Photoshop, but GIMP beats Photoshop handily in terms of price: Standalone versions of Photoshop can cost hundreds of dollars, and buying Photoshop as part of a Creative Suite can cost thousands. The appealing zero-dollar price tag on GIMP has kept it in the running as a less expensive, less powerful image editing option. 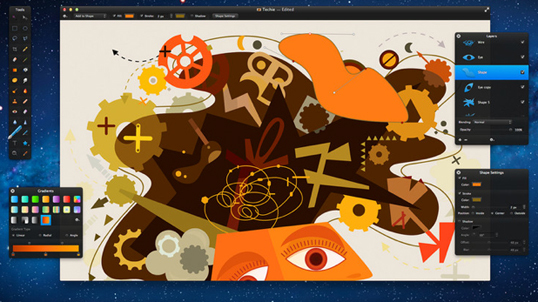 Pixelmator is the latest Photoshop alternative to gain a following. It seems to combine some of Photoshop’s robust power with the low cost of lesser alternatives. Pixelmator is not free, but at $30, it still holds a competitive advantage over Photoshop’s painfully high price tag. Pixelmator also offers a fully-functional 30-day trial for those who would like to try it for their image editing needs. Pixelmator could be a solid, affordable Photoshop alternative. Pixelmator 2.0 may not have all the bells and whistles of Photoshop CS5, but it’s nevertheless a very powerful editing application. It’s got everything you need to edit your photography. That means layers, masks, paths, lots of filter effects, etc., and it can process RAW files. [It’s] the best $30 I ever spent, take the word of a Photoshop expert with 12 years of experience. Because it’s a smaller, less expensive program, it would be hard to argue that Pixelmator is as powerful as Photoshop. But, there does seem to be room in the market for a reasonably powerful, reasonably priced image editor. Are you a Pixelmator fan? Have you tried their 30-day trial? Do you think it can measure up to Photoshop for basic image editing?